You are currently browsing the Bookmobile News weblog archives for February, 2013. Hey, we’re having a fabulous fundraiser on March 14th! In partnership with the Sonoma County Public Library Foundation, we’re inviting you (yes, you!) to an evening of Chocolate and Cinema. How could you go wrong with that? 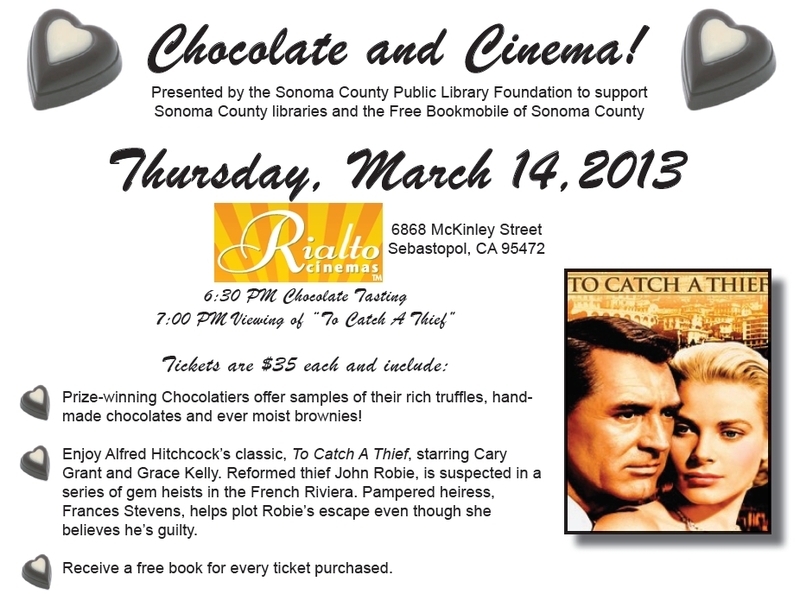 A classic Cary Grant flick, delectable treats made by the county’s best chocolatiers, and the warm company of your fellow book lovers…hooray! You can buy tickets by clicking here. For a modest $35 price of admission, which covers everything, you even get to pick a great book straight from the shelves of Sonoma County’s one and only Free Bookmobile. Click on the flyer image below for more details and mark your calendar now!